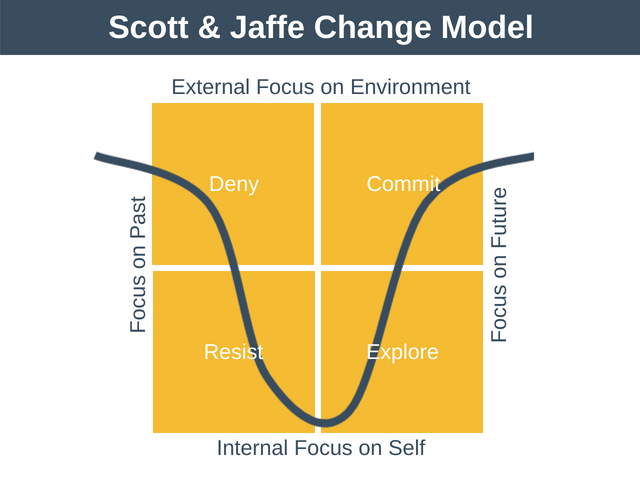 The Scott and Jaffe Change Model, also known as the Scott and Jaffe Resistance Cycle, was developed by Cynthia Scott and Dennis Jaffe, and was first introduced in their article, “Survive and Thrive in Times of Change“. If you’ve ever been responsible for managing change within an organization then you may have encountered resistance to change. Resistance to change can take many forms. Sometimes people quietly disrupt the change. Other times they might overtly try to undermine it. You may have even observed resistance that seems far out of proportion to the scale of the change. People will sometimes vehemently resist a change even if that change is actually beneficial for them. The Scott and Jaffe Change Model is based on the grief curve developed by Kubler-Ross. The grief curve describes the five stages of grief that someone goes through when they suffer a bereavement: denial, anger, bargaining, depression, and finally acceptance. The Scott and Jaffe Change Model doesn’t deal with how to manage the change itself. Instead, it focuses on the people impacted by the change. Specifically, it focuses on how people come to terms with organizational change as it happens. If you want to understand how people respond to change then you need to understand human psychology. Evolution is slow. Humans evolved mechanisms thousands of years ago to deal with what to do if a threat was encountered. Unfortunately, we still use these mechanisms when dealing with organizational change. We’re using outdated psychological mechanisms to handle modern workplace change. Our brain’s fundamental wiring hasn’t evolved as quickly as the world around us. The Scott and Jaffe Change Model is shown below. As you can see from the model, change does not occur instantly but happens over a period of time. This is represented by the X-axis (horizontal). The left side of this axis represents the past, and the right side represents the future. The Y-Axis (vertical) shows where our focus is as the change happens. At the bottom of this axis, we are more focused internally on our own thoughts. We are introspective. At the top of this axis, we are focussed on the external environment. Scott and Jaffe’s Resistance Cycle shows the four stages people go through when undergoing organizational change. Each phase represents part of the journey we go through as we come to terms with change. It involves letting go of the past and welcoming the future. Let’s examine each phase in turn. This is the first stage of Scott and Jaffe’s Change Model. Before we enter this phase we are in the mode of business as usual. We enter this phase when we first learn about the change. Completely ignore the change, pretending it isn’t happening. Downplay the impact of the change on us. Act as though the change will never happen. Employees can feel very stressed during this phase and typically their productivity will decline. Once the reality of the need to change begins to bite we enter the next phase, resistance. In this phase, we accept that the change is happening. However, we are very unhappy about the change so we try to resist it. This resistance comes from our fear of loss and our aversion to this fear. We focus on what we will lose and the value this has to us. We don’t understand how we will have to change and it scares us. We believe that what we will gain will not be as valuable as what we are about to lose. Our resistance may manifest itself subtly or we may overtly resist the change. We will be angry, frustrated, unwilling to engage with the change, and highly critical of the change. When managers face up to this resistance head on and start to tackle it, the organization can begin to move forward. Eventually, when we can resist no more, and we start to accept that the change is actually happening, we enter the exploration phase. During this phase, we accept the change is happening, and we start to explore tentatively what this change means for us. We also begin to explore what this change means for the organization. If you are a manager, then it is important to realize that this stage is very delicate and fragile. If you try to move too quickly through this stage then you risk sending your team members back to the Resistance phase. After we’ve spent time exploring the change, we begin to see the opportunities it offers and we enter the commitment phase. This phase is characterized by people committing to their future. In this phase, we begin to feel empowered and we turn our attention outward towards the future. We take ownership of our future and commit to making it happen. This phase can even be fun as we learn new skills, new ways of working, and look forward to the future. We exit this phase, and the model no longer applies, when the change is finally in place and a new way of working is established as the norm. The Scott and Jaffe Change Model doesn’t apply to all organizational change. Obviously, if an employee’s initial response to a proposed change is that it’s great and they can really see the benefit, for both themselves and the organization, then they will immediately be in stage 4 of the model. In this case, there will be no resistance to the change. In fact, no change model is going to be completely accurate. However, each model can provide us with insight and guidelines which can better equip us to manage change effectively. As a manager, you can make use of the Scott and Jaffe Resistance Cycle during each phase as follows. If any of your team are in denial then you want to move them as quickly as you can to the next phase. Communicate with them to make sure they understand why the change is happening. Ensure they understand the negative implications if the change doesn’t happen. Ask if they have any alternatives to making this change. Ensure they know what is expected of them going forward. Find out what they know about the change. Then fill in any blanks. Enquire about how the change is making them feel. In this phase, we want to acknowledge how people feel, but try to help them move beyond blaming others. Ask what steps they can take right now to help manage the change. Acknowledge their feelings towards the change. Ask what the future looks like for them. Find out how they think things will be different from how they are now. Encourage team members to talk with people who are positive about the change. Ask what team members have the power to control right now e.g. attitudes, behaviors etc. In this phase, we want to help people explore the change from different perspectives, and encourage people to try things out. Ask people how they can make a difference towards the change. Ask what they would like to create from this change. Ask what the future will look like for them and the organization. Encourage people to explore what opportunities there are for them and the organization in the future. During the final stage of the Scott and Jaffe Resistance Cycle, you want to encourage each of your team members to focus their time and energy where the can make a difference. Ask how they will know they have been successful with the change. Help them identify a reward for themselves if they are successful in making the change happen. Ask what long-term opportunities there are for both themselves and the organization. The Scott and Jaffe Change Model is a predictive change management model that shows the phases people go through as they move towards coming to terms with organizational change. As a manager, the model can help you understand how you and your team might react to organizational change. You can then use this understanding to move your team through the change as efficiently as possible.